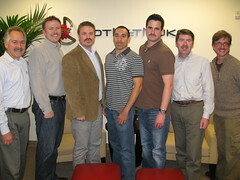 Here is a group Movember photo that we took in the San Mateo DotNetNuke office today (I will be out of the office tomorrow so we did it a day early). For those of you participating, please be sure to take a final Movember photo before you shave off that Mo! Email it to me chris.hammond – dnncorp.com so I can gather them all up. I also want to give a HUGE thanks to those of you who have donated to Team DotNetNuke's Movember cause, your donations are greatly appreciated by the team and will be well used by the various charities they will be routed to through the Movember foundation. For those of you who would still like to donate to Movember, please feel free to do so, in the United States the donations are tax deductible, I would assume you probably get something similar if you donate in Canada as well. You can use one of the following URLs to donate to either of the two Teams, or you can choose an individual on the team to donate to if you wish. You can continue to donate to Movember after 11/30, though I would encourage anyone who wants to donate to do so soon so that you can be mentioned in my wrap up blog post coming next week. I will be out of the office for this final day of Movember, onsite training some of our newest customers, but I will be wearing my Mo, my Movember wristbands and even a Movember button proudly! Thanks again to everyone for the participation this year.